Big thanks to the mGear dev team Jerome and Rafael! Also big thanks to Ingo, Sergei, Charles, Marcus and all the people that are sharing open source projects and helping mGear to be much more complete and robust. Very special thanks to www.studioanima.co.jp for his amazing support to mGear. Last but no lest BIG thanks to all the people that help to mGear development by reporting bugs, sending a pull request and participating on the mGear forum. Keep it coming! Flex: Flex is the mGear models (geometry) update tool inside rigs. Gracias Miquel y cada persona que junto a ti evoluciona mGear. 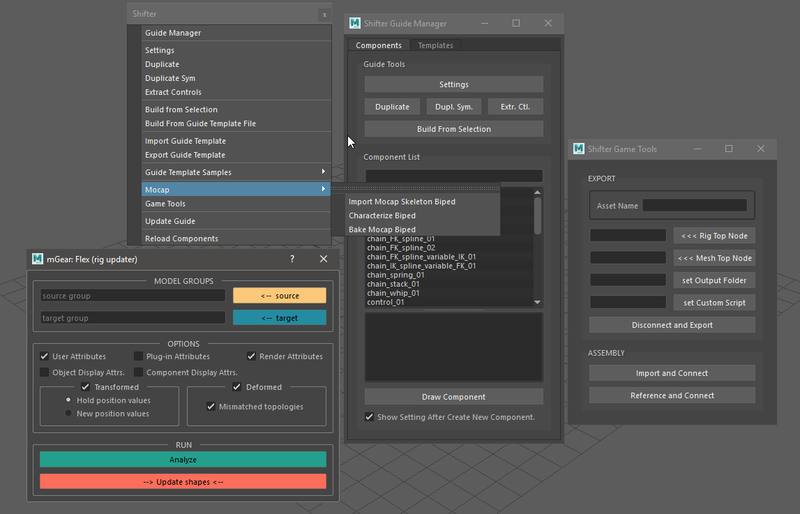 Btw the Shifter Components window (shifter guide manager) now is dockable via (Workspace control) if you have a single monitor or many monitors but your Maya is over-crowded with floating windows, then Shifter will blend beautifully with Maya main layout. Thank you Miquel! I’ve just used the new version of mGear to rig a character and it is working nicely. @elvis75k Can you try to copy the old mgear_solver.bundle from 2.6.1 in the 3.0.3 corresponding folder? Should be the same, because there is no changes in the solvers. Is that the only error log? are other modules having errors? For the path that I see in the log, I guess you copied the files to scripts folder. Is it possible that something is missing? NOTE: This is a general note for everybody. I’m curious as to why 3.0.3 is only 2016.5+ now? Is this because of the inclusion of the weightDriver inclusion? I’m looking to use mGear on a project for 2016, so was just wondering if I could get the latest mGear to work if I just fix some dependencies? did you try it with Maya 2016? what is failing?